These Invitations have each been handmade and are a one of a kind unique design. Each one has been designed by the bride or groom or both and reveals a little about themselves in their own special way. 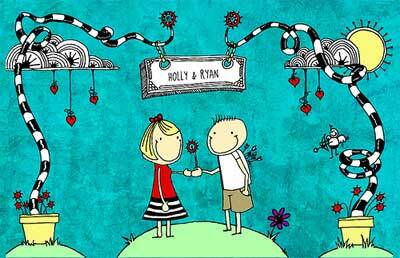 Have a look around our growing gallery for more wedding invitation inspiration. These are truly "think outside the square" designs. 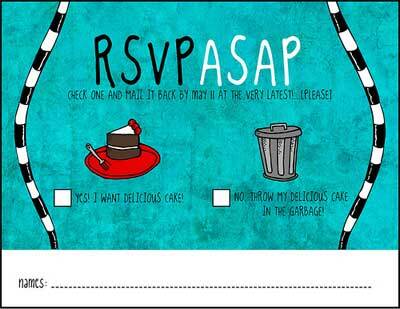 The graphic components of the invitations (stick figures, speech bubbles, some type) were hand-drawn by me, and then scanned into photoshop where I edited them to be a little "cleaner." I ordered custom 17x5.5'' paper from www.thepapermillstore.com, and they were very easy to work with. I used photoshop to align the panels of the invitation and printed them with this huge, nice Canon printer at my parents' house. 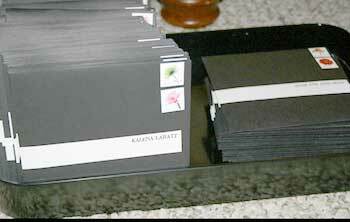 Then I just folded them all, and used a perforator blade to make the last panel detachable to send as an RSVP! The labels for the envelopes were wrap-around labels that I just made up in microsoft word. I bought 8 1/2x11 size sticker paper, and just printed them and cut them out of the sticker paper to be labels! 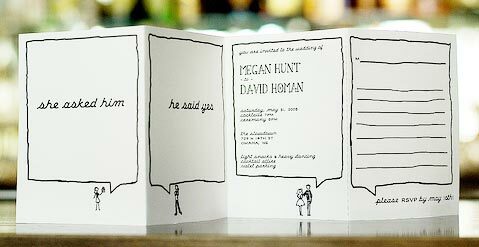 If you think these are cool then you should go and take a look at Megan's equally creative Save The Date cards. I didn't draw it, but I illustrated and colored this bad boy in and its my wedding invitation and I love it as it matches my very quirky wedding. 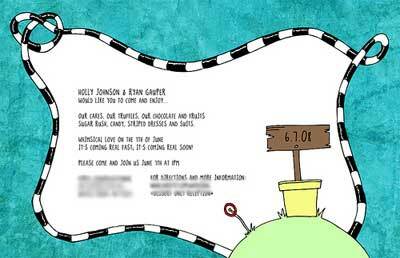 The invite was printed on heavy cardstock - double sided and glossy on both sides. It is 8.5 wide and 5.5 tall, basically an oversized post card. If you were to print them at a local kinkos or at home you can get two per sheet of paper to cut costs. I printed mine at OvernightPrints.com and they do a great job for about $200 - much better than printing at home, better quality and less hassle. To finish off the "wedding identity" we have finally finished our RSVP's and since it took so long to get to them, it is really more of a RSVPASAP. You have got to love these designs. Soooo original. If only I had talent like this! Return from Unique Wedding Invitation Design to Make your own wedding invitations.